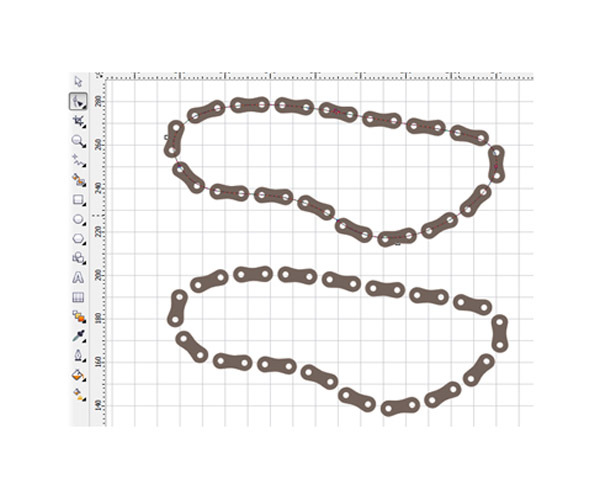 Brmm.. Brmm.. Come on, I drive you to show how to create motorcycle parts pattern using CorelDRAW. This tutorial, you will be learn how to make the gear by using the Polygon, the Fillet Tool, the Envelope Tool and then the chain roller with the Blend Tool. Open a new document. Go to Layout>Page Set Up. Set the paper size to A4, change the units to milimeters. Then set the value to 10 mm for the horizontal and the vertical grid. 1. Click on the Regtangle Tool (F6) in the Toolbox on the left-side of the screen. In the Property Bar, set the object size into 30 mm x 30 mm. Set the Regtangle Corner Roundness to 30. Apply it on all corners. Fill it with C=38, M=0, Y=41, K=0. Then right-click on the white square with a cross at the top of the Pallete Color to delete the outline. 2. Use the Ellipse Tool (F7). Set the object size to 4 mm x 4 mm. Drag the horizontal and the vertical guidelines and put the circle shape like the image below. Go to Window>Dockers>Transformation>Position (Alt+F7). Click the circle shape with the Pick Tool and set the value to 20 mm for the horizontal position. Hit Apply to Duplicate button. Using the Pick Tool, select the two circles and set -20 mm for the vertical position. Hit Apply to Duplicate button, again. Drag a marquee select all objects using the Pick Tool. In the Property Bar, click on the Simplify icon. Then right-click on the white square with a cross at the top of the Pallete Color to delete the outline circles. 1. Make a big circle with the Ellipse Tool (F7). Set the object size to 100 mm x 100 mm. 2. In the Toolbox, pick the Distort Tool. Go to the Property Bar. Choose the Zipper Distortion from the Preset List box, choose the Distort Zipper 1. Afterthat, enter the value 44 for Zipper Distortion Amplitude and 6 for Zipper Distortion Frequency. Click Window>Dockers>Scallop>Chamfer. You choose the Fillet and change the radius into 5 mm from the Operation list box. Enter. Put it in 50% Black. Delete the outline. You should have something like below. 3. Create a small circle and the object size is 30 mm x 30 mm. The color is not important. Select the two circles, go to Arrange>Align and Distribute>Align Centers Vertically (C) and then Align Centers Horizontally (E). On the Property Bar, click the Back Minus Front icon. Delete the outline objects. 1. Use the Ellipse Tool (F7) to draw a circle. The circle size is 50 mm x 50 mm. Duplicate the circle by press Ctrl+D and set the second circle to 48 mm x 48 mm on the Property Bar. Select the two circles, adjust them by pressing C and then E.
2. Now I want to fill the objects with the Smart Fiil Tool. You can find it in the Toolbox. Please select the two outline circles by press Shift key.Fill it black color and choose No Outline in the Property Bar. 3. Drag a regtangle with the Regtangle Tool (F6) and set the object size into 6 mm x 10 mm. Select the two objects. Go to Arrange>Align and Distribute>Align Centers Vertically (C). Click Trim button on the Property Bar. Now, we create the chain first. 1. 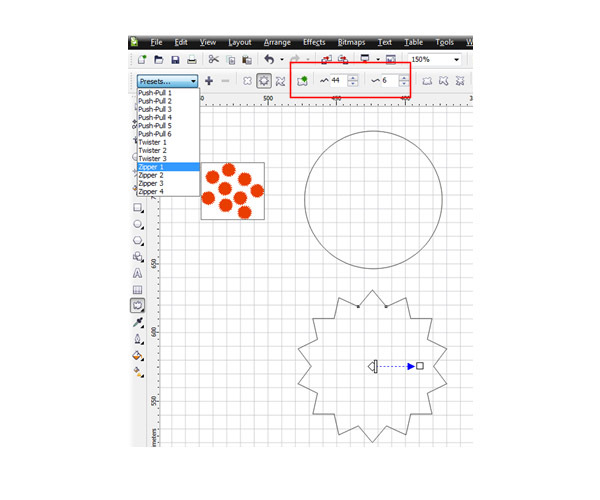 Draw an oval shape with the Ellipse Tool (F7). Set the object size is 100 mm x 60 mm. In the the Toolbox, pick the Evelope Tool. Then click convert to Curves button and select the Vertical option. Go to Window>Dockers>Envelope (Ctrl+F7). Uncheck keep lines. Moving the nodes like similar image below and do the same step to another node in the bottom. Then press OK.
2. Create a 15 mm x 15 mm. Duplicate the circle Ctrl+D. Please place the two circles like in the following image. Select all objects. Go to Arrange>Align and Distribute. From the dialog box, please select Align Objects to the grid and check the Vertical Center and Horizontal Center checkboxes. Apply. Fill them with dark brown. Drag marquee select all objects. Pick the Trim button on the Property Bar. Then delete the outline object. 3. Now, draw a big oval shape. Set it by 140 mm x 50 mm. Press Ctrl+D to the chain. Please place the chains like this. And then take the Blend Tool in the Toolbox. Set the number of steps or offset between blend mapes to 4 on the Property Bar. Stretches the chain shape to be smaller. 4. On the Property Bar, pick the Path Properties and choose the New Path. The cursor will change intro a wavy arrow black and click on the oval path. After that, click the Miscellaneous Blend button in the Property Bar. Enable the Blend along full path and Rotate all objects on check box. Change the number of steps or offset to 15. 5. By clicking Ctrl+Q, go to Shape Tool (F10). 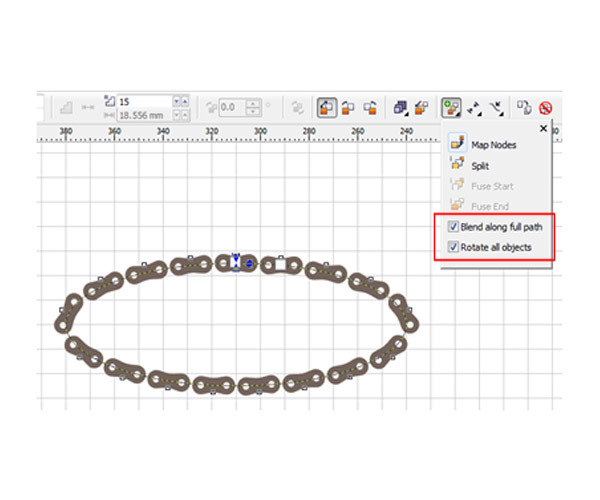 Click the oval path then you can moditify the chains where ever you want it. Drag a marquee select all objects. Go to Arrange>Break Blend Apart (Ctrl+K). 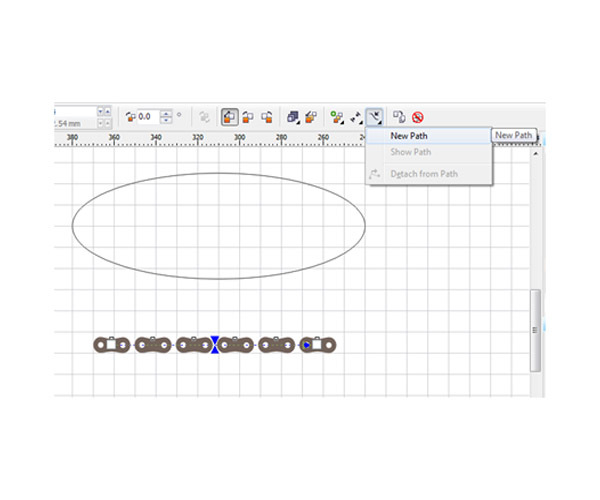 Select the oval path and delete it. Select the chains, group it by pressing (Ctrl+G). Draw the square shape, sets to 600 pixel x 600 pixel. Fill it with C= 4, M=4, Y=77, K=0. Make sure the shape outline is set to none. Copy and Paste the gasket, the gear, the ring piston and the roller chain. Scale and Rotate them as you want. And spread it all over the background or inside. Apply the same step to another objects in the bottom. Drag a marquee select with the Pick Tool. Group together all of the objects by pressing Ctrl+G. Go to Effect>PowerClip >Place Inside Container. Use the Bold arrow to click on the background. All objects will place inside the background. Last touch, you only just repeat the previous steps that we made the circles. Select the pattern, set the value horizontal position= 600 px, vertical position= -600 px and again horizontal position= -600 px. 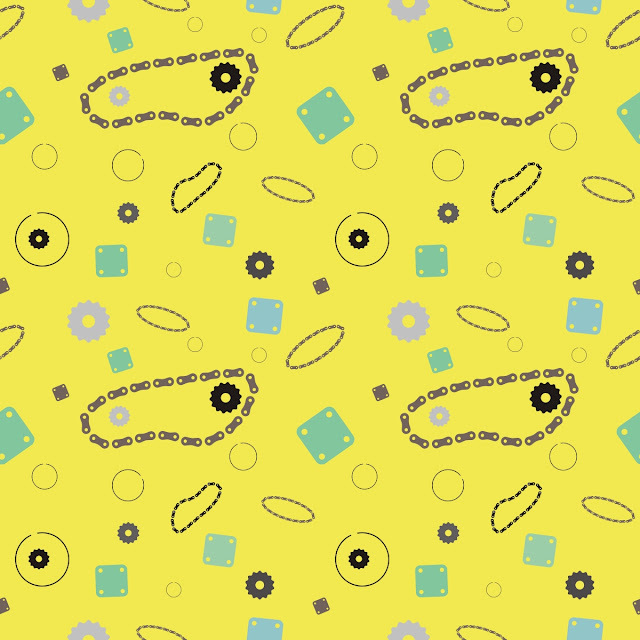 Show me your pattern parts in the comment section below, if you have done create it!